The [U.S.] Army continues to develop an overarching warfighting concept and supporting equipment that will leverage and depend upon unmanned systems (air and ground) to achieve success on tomorrow's battlefields. In FY2003 the Army awarded contracts to further develop robotic prototypes for the FCS multifunction utility/logistics equipment and soldier unmanned ground vehicle components. The [Joint Robotics Program] is working with the Robotic Systems Joint Project Office, the Defense Advanced Research Projects Agency (DARPA), and the Army Science & Technology community through the DEMO III+ program, a Collaborative Technology Alliance, the National Center for Defense Robotics, and other demonstration efforts to fully support the FCS concept and the JRP community as a whole. The result will be a system of systems that will enable our forces to See First, Understand First, Act First, and Finish Decisively. The last 14 years of robotics R&D have provided a solid technology foundation for FCS that will pay significant dividends and enable early insertion of robotic capabilities into selected Current and Future Force formations. The war against terrorism has created urgent and compelling worldwide requirements for UGVs. JRP members are responding to these requirements by deploying unmanned countermine, explosive ordnance device (EOD), and reconnaissance systems to support our troops in the Balkans and in Operations Enduring Freedom and Iraqi Freedom. Prototype and fielded UGVs participated in and are essential tools in completing dangerous missions in support of our forces in Afghanistan and in Iraq. As our forces in Iraq have transitioned to counter-insurgency operations, requirements for UGVs to assist in neutralizing Improvised Explosive Devices have increased dramatically. 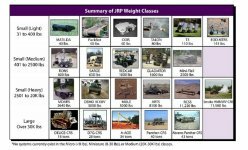 The JRP is meeting the needs around the globe with a combination of All-purpose Remote Transport Systems, Remote Ordnance Neutralization Systems, Mini-Flails, Panthers, prototypes, and Commercial off-the-Shelf systems including over 162 new systems on their way to Central Command in FY2004 alone. These systems will provide the Services with unmanned force protection, EOD, and countermine capabilities. Increasing Service UGV demand and positive feedback from users in the field have validated the JRP strategy while emphasizing the need to get solutions to the field as quickly as possible. UGV systems of FCS include three distinct vehicle types and a coordinated program for developing a common autonomous navigation capability. The Multifunction Utility/Logistics Equipment Vehicle is an unmanned platform that provides transport of equipment and/or supplies in support of dismounted maneuver forces. It will also be capable of being armed in the role of support to dismounted infantry in the close assault. The Armed Reconnaissance Vehicle (ARV) will consist of a common chassis and two variants of mission modules: The ARV Assault and the ARV RSTA variants. ARVs will be used to rapidly shape the battlespace and provide force protection that enhances operational and tactical flexibility. The Soldier Unmanned Ground Vehicle (SUGV) is a man-packable small robot system, weighing less than 30 lbs, used for Urban Operations environments and subterranean features to remotely investigate threat obstacles, structures, and the structural integrity of facilities and utilities. SUGV systems will be highly mobile for dismounted forces and will be capable of being re-configured for other missions by adding or removing sensors, modules, mission payloads, and/or subsystems. The Autonomous Navigation System (ANS) is the heart of the ability to conduct autonomous operations. 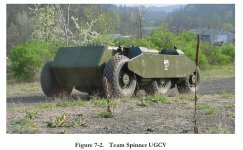 ANS provides each of the UGV platforms with the necessary perception, control, and computing capability to perform intelligent mobility and tactical behaviors. The Future Combat Systems (FCS) is the key element of the Army's plan for transformation. It will combine both manned and unmanned component elements with seamless command and control architecture in order to create a tactical system of lightweight vehicle elements. These elements will be smaller, lighter, and more deployable than today's fleet yet significantly more lethal and survivable. The Future Force Warrior program will focus upon enhancing the capabilities of the individual soldier. Unmanned vehicles will play an important role in this effort, providing small man-portable robots for use in urban terrain to aid in the clearing of building interiors, tunnels, and sewers. They will also reduce the soldier's combat load by providing a Multi-purpose Utility/Logistics Equipment (MULE) platform to carry food, water, and ammunition until required by the soldier or small unit. The Army Research Laboratory (ARL) Robotics Research Program played a key part in developing the perception, intelligent control, and man-machine interface technologies that are required to create these new systems. To accomplish this task, ARL adopted a multi-track approach. It is developing technology through the Robotics Collaborative Technology Alliance, a cooperative venture between ARL, and a consortium of 12 industrial and academic partners, as well as associated programs with other Government laboratories. ARL is integrating this new technology on a series of experimental Unmanned Vehicle (XUV) platforms through the Demo III+ program to permit engineering evaluation of new algorithms and sensors in a systematic manner in relevant environments. Finally, ARL is undertaking the assessment of technology maturity through a series of structured experiments that will aid materiel developers in determining the ability of robotics technology to meet military requirements. The Army's Future Combat Systems program will develop a network of centric concepts for a multi-mission combat system that will be overwhelmingly lethal, strategically deployable, self-sustaining, and highly survivable in combat. This is achievable through the use of a Family of Systems (FoS), which is an ensemble of manned and unmanned ground and air platforms that operate as a System of Systems (SoS). The goal of the FCS program is to design a FoS ensemble that strikes an optimum balance between critical performance factors including: (1) ground platform strategic; operational and tactical mobility; (2) lethality; (3) survivability, and (4) sustainability. This SoS design will be accomplished by using modeling, simulation, and experimentation to evaluate competitive concepts. The FCS program will be capable of adjusting to a changing set of missions ranging from warfighting to peacekeeping as the deployment unfolds. An FCS-equipped force will be capable of providing: (1) mobile-networked command, control, communication, and computer (C4) functionalities; (2) autonomous robotic systems; (3) precision direct and indirect fires; (4) airborne and ground organic sensor platforms, and (5) adverse-weather RSTA. 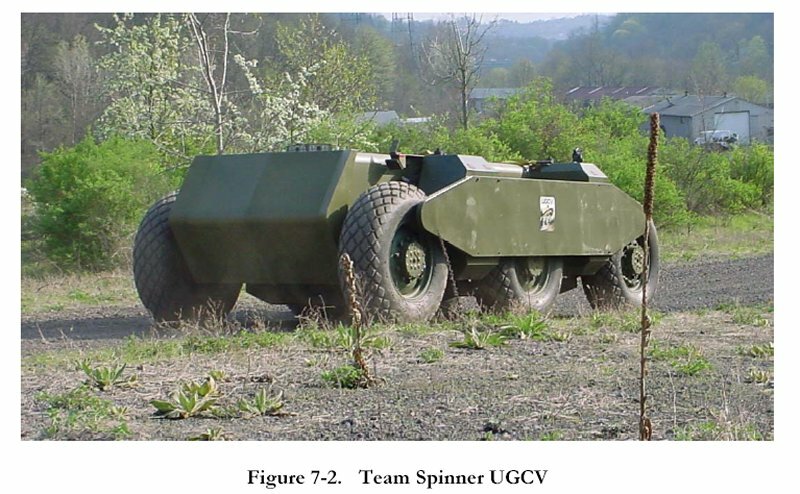 The FCS will support an Operational and Organizational Concept that calls for the use of FCS in Units of Action (nominally Brigade Level) that possess three types of UGV: (1) Armed Robotic Vehicles (RSTA and Armed Variants); (2) Utility/Logistics UGV (MULE - with five mission equipment packages), and (3) Soldier/Small UGV (SUGV). These UGV's will be a critical piece of the Unit of Action's ability to conduct a dominant maneuver across the spectrum of conflict. They will perform a wide variety of tasks including LOS and BLOS fires, RSTA, Assured Mobility support (obstacle detection and neutralization), and communications relay in all terrain sets. 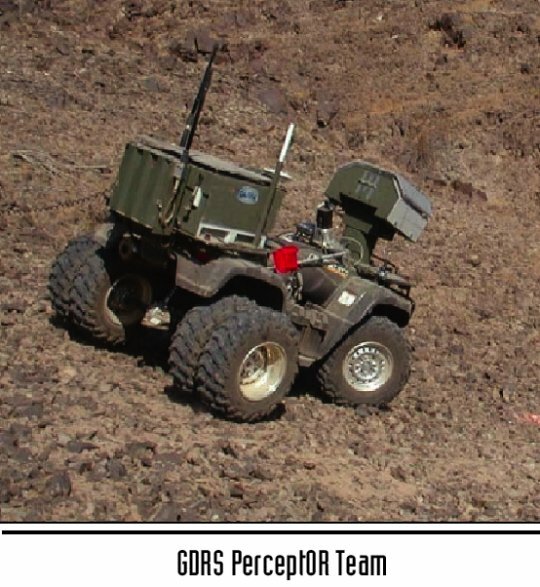 The foundation for the introduction of these advanced UGV concepts into the Unit of Action is derived from the full gamut of programs contained and supported by the Joint Robotics Program. 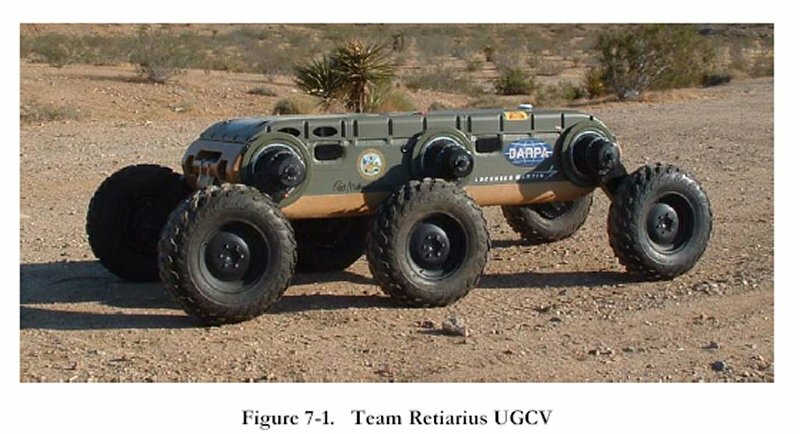 DARPA and the Army are jointly funding the UGCV program, which is being managed by DARPA. This program seeks to explore the performance gains enabled by designing combat vehicles without the constraints of accommodating an onboard crew. Primary performance metrics for the UGCV program are: (1) endurance; (2) mobility, and (3) payload fraction. Additional secondary metrics include: (1) airdrop-ability; (2) robustness to crash; (3) reliability; (4) signature, and (5) cost. The UGCV program completed eleven preliminary designs over nine months in FY01 and selected four designs in early FY02. These four designs were then used for critical subsystem testing and detailed prototype design. Two of these designs were capable of 1500 kg of payload and two were capable of 150 kg payload. 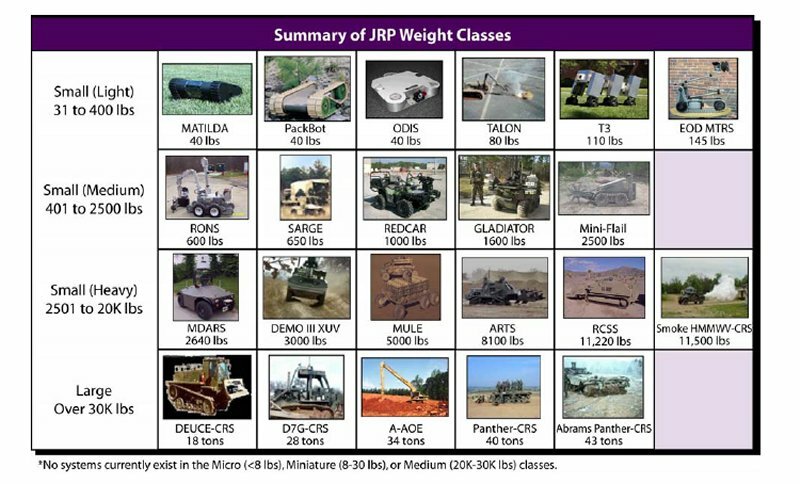 These payloads can range from marsupial robots to sensors to weapons systems to smaller air vehicles. Two of these designs (one of each payload class) were selected in July 2002 for full prototype fabrication. Testing against the program metrics began in January 2003 with a 12-month series of experiments involving varying terrain and obstacles. Like the UGCV program, the PerceptOR program is jointly funded by DARPA and the Army, and is also managed by DARPA. 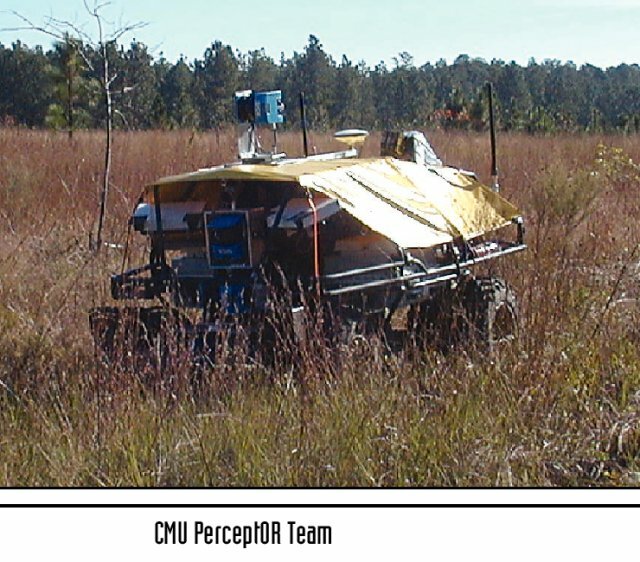 The PerceptOR program is examining the benefits of using several different perception approaches for off-road robotic navigation by conducting unrehearsed field experiments in a variety of terrains and weather conditions. The PerceptOR program completed the outfit of Honda all terrain vehicles (ATV) with four different perception approaches during FY01. Three of these teams were selected in December 2001 for Phase II, which included both at-home developmental testing and unrehearsed experiments at four off-road sites during calendar year 2002. These experiments have highlighted the strengths and weaknesses of each approach as a function of terrain type and available weather. In addition, PerceptOR will examine assumptions that a-priori overhead data and multiple cooperative vehicle perspectives (including ground and air) can be helpful in off-road robotic operations. In February 2003, PerceptOR began Phase III, which consists of technology insertions based on the experience gained from the field and further testing that occurred under degraded conditions.